The album cover of The Beatles' classic "Abbey Road" showed the Fab Four crossing the street outside the famed studio. Abbey Road, the legendary London g studio where The Beatles recorded some of their biggest hits, is up for sale. Cash-strapped EMI Group hopes to raise tens of millions of dollars through a sale, but no buyer has been located, according to The Associated Press. The label, whose artists include Coldplay and Robbie Williams, reportedly needs $165 million through the end of the year to avoid defaulting on a loan from Citigroup. EMI bought the Georgian townhouse in St. John's Wood in 1929.Albums recorded there include Pink Floyd's "Dark Side of the Moon," Wings' "Band on the Run" and Radiohead's "OK Computer." It is most closely associated with The Beatles, who recorded most of their albums there. 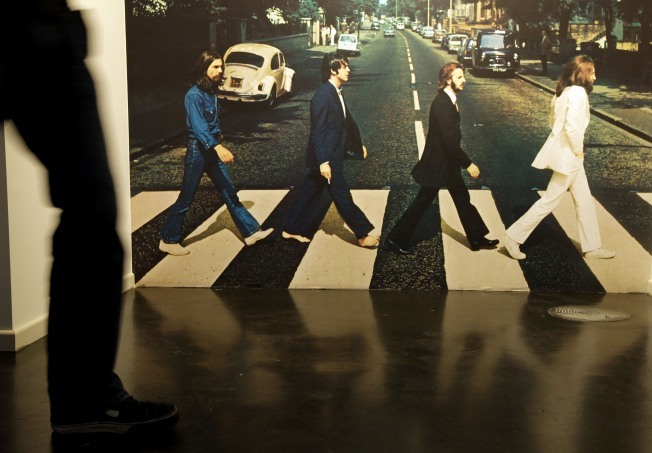 The crosswalk in front of the north London studio was immortalized on the cover The Beatles' final studio album, 1969's "Abbey Road."